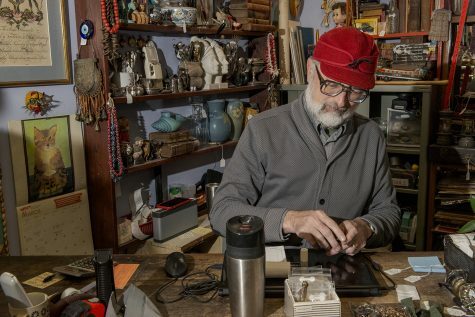 For over two decades, Todd Thelen has bought and sold countless oddities and artifacts. To him, the antique business “has always been in his DNA." On a frigid, windless day last week, Artifacts owner Todd Thelen peered with dismay at the large selection of vintage men’s cuff links in front of him. As he slowly began sifting through the metallic objects with a look of rugged determination on his face, an older man walked into the store brandishing a small purple chalice with an acrylic stem. The man grunted, shrugged his shoulders, and exited the store. Thelen went about his cuff-link sorting, humming a rendition of a Gloria Gaynor song that was playing on the radio behind him. If you were to close your eyes for a moment and imagine the stereotypical proprietor of an antique store, someone like Thelen might come to mind. His vintage eyeglasses, immaculate gray shirt (complete with shoulder patches), Giugiaro-designed Seiko wristwatch, and mindfully scraggly salt-and-pepper beard — paired with an encyclopedic knowledge of all things vintage — are exactly how someone who knows about obscure objects is supposed to look. Artifacts owner Todd Thelen catalogs items from an estate on Thursday, March 7, 2019. Artifacts trades in goods both on consignment and through purchasing. Thelen came to the University of Iowa in 1988 to pursue an M.F.A. in printmaking and began to buy and sell antiques to pay for school. Although he started by selling items sporadically, he set up a booth at the now-defunct Granny’s Antique Mall. Eventually, he began consigning items to former Artifacts owner Mark Stevenson; the two built a rapport, and Thelen bought the business from him in 2003. 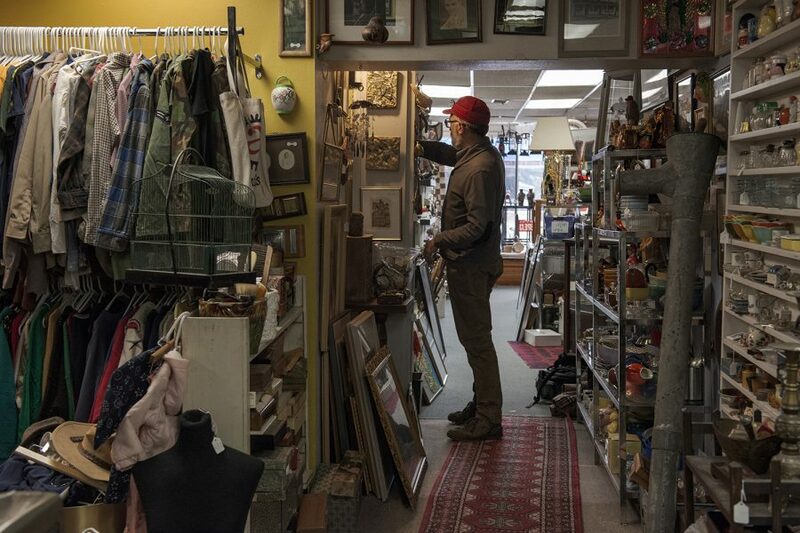 This realization, he said, coupled with antiquing shows such as “American Pickers,” have caused “a few headaches,” such as the occasional customer who becomes displeased with the actual value of their item. Despite these minor setbacks, Thelen said, many people still realize that there is something special about coming into a store and seeing everything up close. Artifacts also refuses to sell online. Despite the changing market, Thelen said, small businesses are finding new ways to distinguish themselves. Assorted odds and ends for sale sit on display at the Artifacts antique store on Thursday, March 7, 2019. Although admittedly cliché, he said, many customers come into the store to escape whatever is happening in their lives. As Thelen returned to cataloging various accoutrements, Margaret Roberts, who has worked at Artifacts for nearly 10 years, stood hunched over a garbage bag full of vintage photographs. Roberts, who also received a degree in printmaking, said she “shares a mindset with Thelen.” Throughout her tenure at the store, Roberts said, she is often surprised by what sells — and what doesn’t. A golden bull is seen on the side of the Artifacts antique store on Thursday, March 7, 2019. 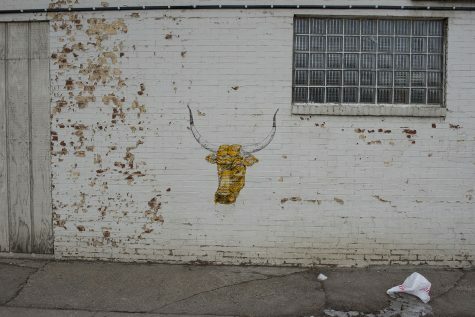 The bull was originally the work of a vandal, but owner Todd Thelen decided it added character to the store’s exterior. Chicken bones aside, it is incredibly easy to get lost in Artifacts. To the left, there is a Marc Chagall lithograph surrounded by pocket watches. To the right, a pastel-colored Eames chair and an antique crib full of rather menacing-looking sock monkeys. Atop this mountain of antiquities and oddities is the Kingdom of the Obscure’s emperor, who rules with a mighty — albeit eccentric — sword.